Jackie Macadam learns about the life and background of the Rev Dr David Coulter, Chaplain General to HM Land Forces. 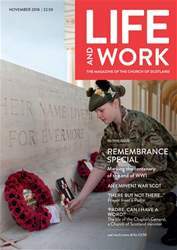 The Rev Dr David Coulter, Chaplain General to HM Land Forces, is talking about his feelings as he ‘represents’ the Church of Scotland at the highest levels of the Royal Army Chaplains’ Department. “Since 1796 there have only been 23 Chaplain Generals and I have the enormous privilege to be the 24th. I am also only the second Church of Scotland minister to hold this position after the Very Rev Dr James Harkness. I became the Chaplain General on September 17 2014, the day before the Scottish Independence vote, and received the blessing of the Church of Scotland by the Very Rev Dr John Chalmers in a wonderful service in St Giles’ Cathedral.